I can remember a reporter asking me for a quote, and I didn't know what a quote was. I thought it was some kind of soft drink.--Joe DiMaggio, Hall of Fame outfielder. Back again, for a third edition, this compendium of the greatest baseball quotes of all time brings both the wisdom of the world and the bull of the bullpen. 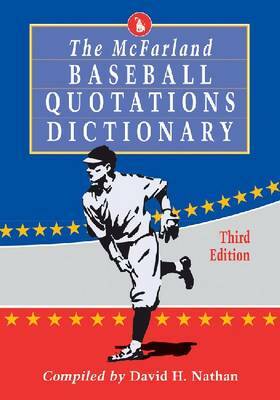 From the equally absurd and profound ""Yogi-isms"" of Yogi Berra (""If you come to a fork in the road, take it"") to some of the greatest put-downs of all time (""He's good, but I don't think there's anyone in the world who's as good as he thinks he is""), this dictionary of baseball quotations will remind every reader that there is plenty of time for conversation while the game goes on. Organized by theme, the more than 5,800 quotations include the date, team, position and historical background when available.